Updated March 2018 with 3D Blu-Ray comparisons. A popular fact amongst fans is that the middle image is actually a Visual Effect. The shot gives the impression that the camera was set up on the right side of the canal shooting left, as if on the same side as the camera in the first image. However, this entire scene was “flipped”. The camera was actually on the left side of the canal shooting right. In order to make the scene cut together better in the edit, the whole image was reversed to match the other shots. Click on the image for a bigger version and you can see the Freightliner badge on the front of the truck is backwards, due to the flip. The blue “Plummer” street sign was digitally reversed by a special effects company. All of those reversed shots meant that when they were flipped the negative in the edit, it looked like Robert Patrick/T-1000 was sat in the drivers seat, and not in the passenger seat. In fact, most of the canal scene was flipped. There was a stunt person driving the truck, behind black cloth and hidden from the camera. The passenger side of the vehicle was fabricated with a steering wheel for the T-1000 (Robert Patrick) to operate. This allowed Patrick to concentrate on the acting and not actually have to drive the truck. Patrick even wore a reversed police badge on a reversed police shirt. Even Edward Furlong wore a reversed Public Enemy t-shirt whilst riding the motorbike. The following image taken from the theatrical trailer (00.34) shows a police car exploding outside the Cyberdyne building, which isn’t in the final version of the movie. And this close-up shot of Arnie shooting to the left with the mini-gun from inside the Cyberdyne building (00.34) isn’t in the final film either, although a similar shot of the mini-gun pointing in the other direction is. I also noticed that the Press shot for this scene was photographed during the second explosion. Notice the shadows are the same on the pillar as they are in the movie. And going by the angle of the pillar and the trickle of water in the canal, we can see that the photographer was probably 10 feet or so to the right of the film camera that captured the scene. Here is the Press shot. I’d love to see the movie in the original “flat” 35mm format. In 2013 some smaller specialist cinemas in the US ran special screenings and they were very popular. I’m hoping a cinema in the UK will follow suit. With the actual video resolution of the Blu-Ray Ultimate Edition being 1904×808, the above image shows there is a potential for a 1full 1920×1080 version. 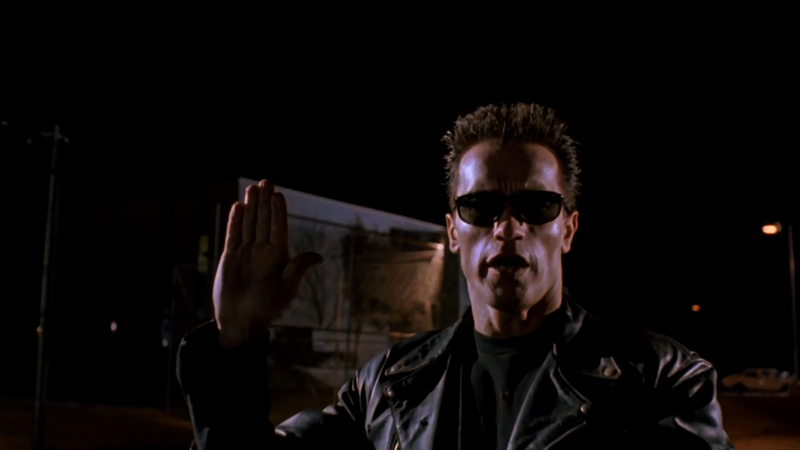 You can buy Terminator 2 – Judgment Day (Skynet Edition) by clicking this link. 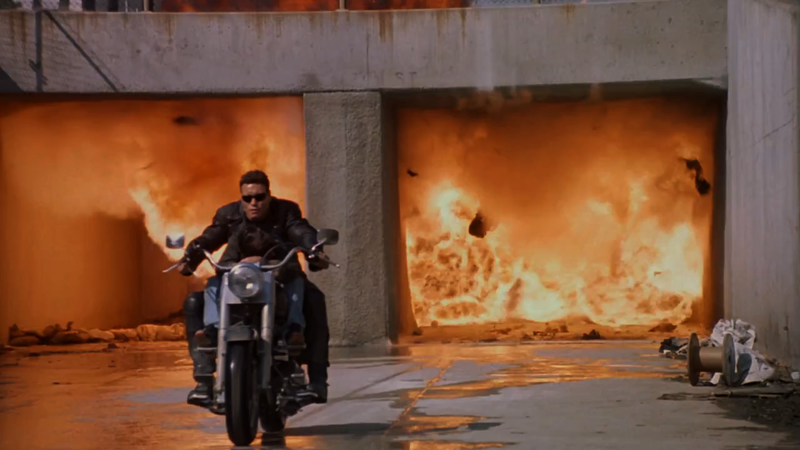 Update: After much research there was a glimpse of hope that accidental releases existed of Terminator 2 that were either a) not graded, and therefore the original colour, and b) a non-matted version which showed the entire 35mm with absolutely no cropping. However. The Japanese laserdisc (PILF-2187), seen by some as the Holy Grail for being released without authorisation by James Cameron and therefore the only version released without a colour grade, turned out to just be slightly different. There ARE differences, but to my eye it does not look like the trailers. It’s still a sought after version of the movie. If you can find this version on laserdisc, snap it up! And secondly, the rumoured non-matted version has so far turned out simply to be 4:3 Pan and Scan release on DVD, and only ever released in Russian. Here is a wonderful example of what Pan and Scan versus widescreen looks like. This video clearly shows there is a much fuller version out there, that none of us have seen! Fantastic! Thanks for your work. I have watched T2 as a teenager over 100 times and could never get my head around what makes the movie look so unique. The trailer looks like a normal TV-movie. The 2.35:1 ratio makes it appear totally different.